As usual, we started off from IISc at about 05:45H. There were only five riders, Poovaiah on his new FOMAS Road King delux (a two week old road bike, but more on that later), Devendra with his Hawk, and three MTBs - Prakash, Sree (Hero Thunder) and me. We had all assembled at C mess parking - which has become a sort of ceremonial flag-off point - by 5.30. After some debate on the route to take, we decided to head out via NH4 and ring road, to Magadi Road, which would lead us to our destination - the TG Halli reservoir and dam. There was the option of taking pipeline road, and cutting a few km off, but none of us knew the road well enough to risk it in the pre-dawn darkness. We proceeded at a gallop till Magadi road, all downhill. The first climb on Magadi road was pretty tough and knocked the wind out of our sails. After a few minutes of rest we set off again. 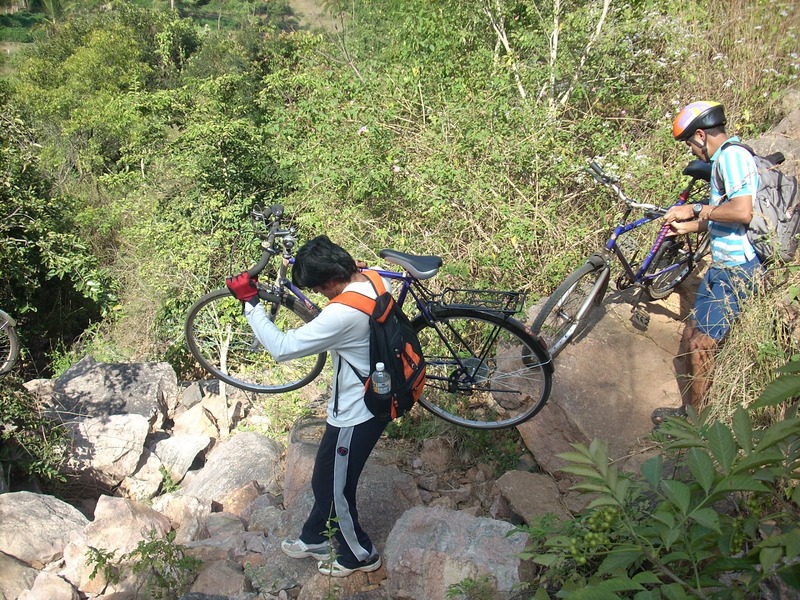 About 5km down the road deteriorated into an almost-MTB terrain, slowing us to a crawl. Even the MTBs were having a tough time. But as we approached the city limits, the road became much better and we picked up the pace again. This section of the road, all the way till the T. G. Halli reservoir, is very scenic, with rolling hills, gentle slopes and big shady trees. We overshot the entrance to the reservoir itself by about 4km. By then we had done about 35km non-stop, and we were desperately looking for some breakfast.A few km ahead is a small village where we downed a few plates of idlis, bananas and some tea. Then came the big question of what was the easiest route to Manchanbele. From the locals we found that there were two options - go a few km back and ride almost straight to Manchanbele along a narrow off road trail, or ride straight on along the state highway, covering a big loop to Manchanbele. We chose the first. The trail turned out to be superb. It started off as metalled road in bad repair. 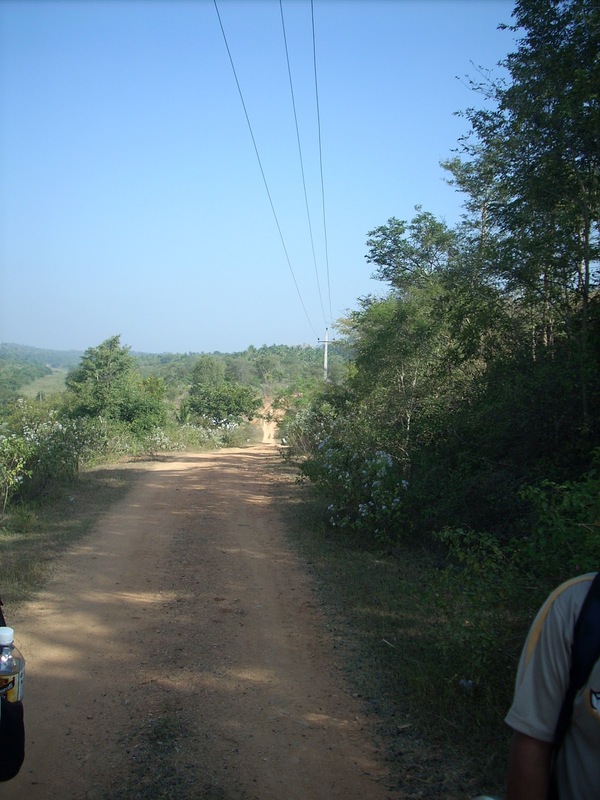 Soon afterward the road became a graveled path, and within the next few kilometers had become a trail rutted with tractor tracks. We discovered that the tractors and motorcycles belonging to the farmers along the trail were the only vehicles that came this way. About halfway to Manchanbele, the trail became narrower - barely wide enough to walk - with wild plants brushing our calves.At one point we actually had to carry our cycles across a small gulch. After we crossed the trail became wider and eventually hit the banks of the Manchanbele reservoir. On the return, we took the highway via Big-Banyan-Tree and the Byayalu station. The biggest problem on this route is, i believe, the lack of good places to have food.